Yet Another Eagle Project was completed this past weekend in our community. This one was interesting, useful, and fun to help with. Our elementary school just invested in an outdoor classroom this summer, spending tens of thousands of dollars on landscaping natural seating into a bowl-shaped area of the forest on the school property. 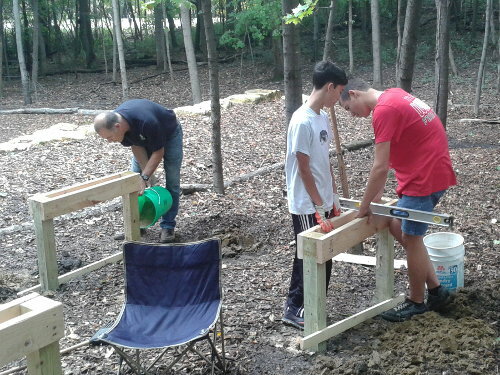 This eagle project enhanced the usability of the area by designing, building, and installing four outdoor laboratory tables. The tables will be used by students for experiments about the environment, animal life, climate, and other nature studies topics. The design is very sturdy and should hold up for many years of changing Minnesota seasons. The tables are set on two 4x4 posts sunk into the ground over 40 inches and rest at the correct height for small children. Each table is a box with hinged lid, creating a protect work area. I took my orders from the Eagle candidate and spent my time digging holes with a post hole digger until he told me to stop. I think I did a pretty good job! Another eagle project was done here earlier in the summer, also as part of this new outdoor classroom. It is the 'chalkboard' for the classroom - protected by small roof, locked protective plywood doors, and sturdy support structure. I'm excited to see the new classroom in use this year. If you know of some Eagle candidates looking for projects, these outdoor classrooms are being set up in lots of schools now - might want to check locally. Or, I have many other ideas for Eagle Scout service projects. Very cool idea! Way to go guys!